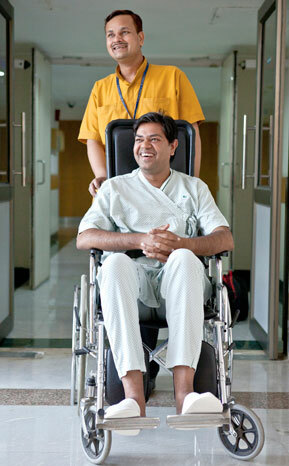 The Apollo Institutes of Orthopaedics at Indraprastha Apollo Hospitals is at the forefront in offering the latest in orthopaedic treatments and surgical techniques. The centre performs surgical procedures which include the most current arthroscopic and reconstructive techniques – including major joint replacements including the hip resurfacing and shoulder surgeries, arthroscopies, laminectomies, the most delicate hand surgeries and much more. The most advanced medical equipment and a team of highly experienced surgeons is supported by the most advanced state-of-the-art technology. The Apollo Institutes of Orthopaedics at Indraprastha Apollo Hospitals Delhi is at the forefront of current Orthopaedics and offers the latest in orthopaedic treatments and surgical techniques. The center perform advanced surgical procedures which include the most current arthroscopic and reconstructive techniques – including major joint replacements, revision joint replacements, hip resurfacing and shoulder replacement surgeries, knee, shoulder & hip arthroscopies, advanced spine surgeries, hand surgeries and much more. Our team of highly experienced surgeons are supported by the most advanced medical equipment, computer navigation and imaging equipment. Indraprastha Apollo Hospital is also one of the first centers for Articular cartilage Implantation (ACI) in northern India. It offers all type of cartilage regeneration surgery, including micro-fracturing, mosaic-plasty, ACI. It is also one of a few centers having a dedicated pediatric orthopaedics unit offering the whole range of pediatric orthopaedics. Orthopaedic surgery & traumatology has seen significant developments in the diagnosis & treatment of various diseases of the bones & joints & the treatment of fractures & dislocations etc. It now considered to the most sought clinical branch in passing out medical students. Most of the injuries can now be managed in such a ways that people can return to their work in very short span of time & the fracture healing occurs in good alignment & much faster, with the use of modern fracture fixation techniques. Most sports injuries (like ligaments, meniscus, cartilage etc.) can now be treated with key-hole (arthroscopic) surgery. Severely damaged joints can now be replaced making the person active again. These artificial joints behave almost like normal joints & can last for about 20-25 years, in most patients. Spinal surgery has seen significant advances with the advent of operative microscope, image intensifier etc making it a very safe & reliable surgery. A Pediatric Orthopaedic Surgeon deals with various disorders affecting the musculo-skeletal system in a growing child, and hence the age spectrum he is associated with ranges from new-borns to adolescents or young adults. The conditions that he manages can be classified into Traumatic & Non-Traumatic. The latter can again be classified into ‘solitary’ and ‘multi-disciplinary’ conditions. Since the inception of the Apollo Institutes of Orthopaedics in 1995, we have been pioneer in doing various routine & high-end surgeries, like modern fracture fixation techniques, using interlocking nails, locking plates etc. Arthroscopic surgery of various joints like knee, shoulder, ankle, elbow etc. are being routinely performed here. Procedures like Arthroscopic ACL reconstruction, meniscal surgery, Bankart’s & rotator cuff repairs are being done successfully. Recently, we have established the 1st centre in Northern India to perform Cartilage transplantation. All types of joint replacement surgery e.g. primary, complex primary & revision replacements are being done in large numbers with excellent outcomes. Micro-discectomies, spinal decompression & fusion surgery are being done routinely. Apart from the clinical work, the institute has regular academic teaching program. We are running DNB accredited course. There are regular publications in the national & international journals from the clinical work of the institute. Most of the consultants are invited to give lectures as faculty in various national & international conferences & seminars. We also organize various workshops & conferences in the hospital regularly. Apollo Institutes of Orthopaedics has been ranked as one of the best institutes in the country. The institute has very senior & experienced Orthopaedic surgeons with adequate International experience & education. Each surgeon has some special area of interests in various fields of Orthopaedic surgery & hence offers specialized treatment in that sub specialty. This busy institute has 11 full time senior consultants, who offer wide range & high-end orthopaedic treatment to the patients who are visiting from within & outside India. We have dedicated & well equipped Orthopaedic OT complex with laminar flow & various modern equipment like image intensifier, operating microscope, computer navigation system, top of the line arthroscopy system etc. Backed by the Physiotherapy & Radiology department, Apollo Institute of Orthopaedics has a very high success rate in all the procedures that it undertakes.